"One of my favorite products on TPT!" - Danah R.
Your one stop source for November reading! Inside are 20 November themed information text passages written at FOUR different levels. 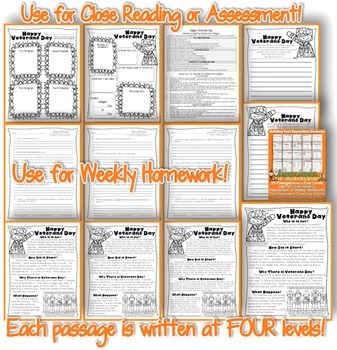 Use for Close Reading and/or week-long homework! Informative, Relevant, Engaging, and Meaningful Reading! *** Full Answer Key for ALL three question pages. Save Ink! One page is used for each of the three question pages. Included with the answer key are the text based questions. Provided for those who are not using all of the student question sheets. ---- (One "Fill-In" Fun poster graphic organizer per passage. Ensure students get the gist. *** 2 Writing pieces per passage. ---- For opinions/ text evidence/ personal connections! *** Three Text Coding Posters. One for each Common Core Category! ----- Sequence, Cause & Effect, Compare & Contrast, Descriptive, Problem & Solution. >>>>> Over 20 additional Common Core Informational Text Graphic Organizers. ------ Each is labeled with the standard. 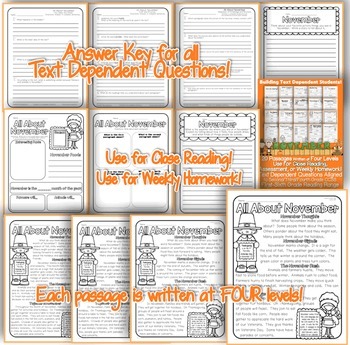 >>>>> Three Generic Comprehension Sheets Free of Common Core Standards. ----- Provided for anyone who are not using CCSS. ----- One blank template for each version. Twelve pages total. *** Modern clickable navigation in the table of contents which also has lexile levels. 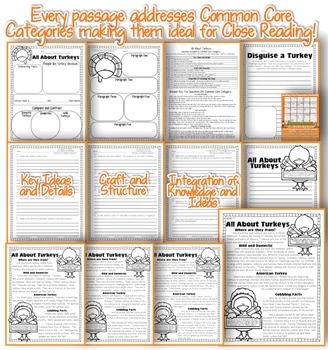 These timeless close reads and the corresponding activities can be used all year! Not just during November! 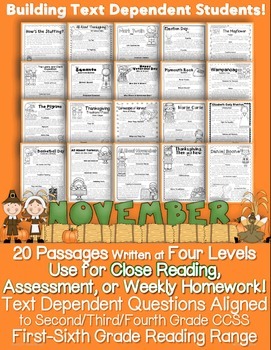 Use the differentiated passages for fluency practice! Each passage page has the word count and lexile level clearly indicated. Will work nicely for whole group, small group, social studies, science history, weekly Common Core homework, and more! This set will also work perfectly for read-alouds. Common Core Standards are listed in the answer key and next to each question so you are sure which standards are being addressed.